I think I was more than a little excited to present Sarah with her first Montessori lesson. 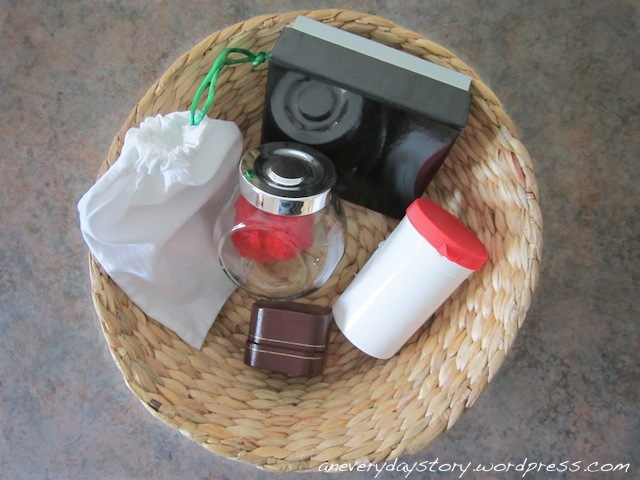 Sarah has Montessori toys and has explored treasure baskets before but this would be the first time I sat down with her and presented an activity to her; an opening and closing basket. This activity is a preliminary practical life activity. 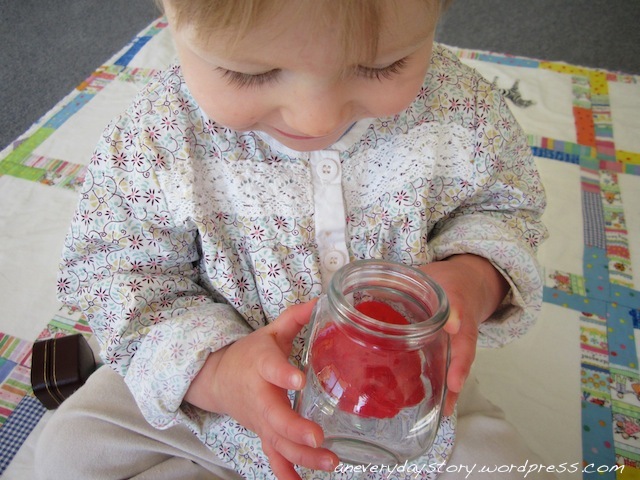 It gets those little hand and wrist muscles working as well as helping the child to learn to open containers independently. Since Sarah is still quite young, 13 months, her basket was quite simple. A small gift box (lift open), a ring box (pull open), a vitamin container (pop open), a glass jar (twist open) and a drawstring bag (pull open). Each container had a little treasure inside; a pompom, feather, wooden peg and coloured popsicle sticks. I sat down on the mat in the playroom with the basket and asked Sarah if she wanted to come over. She was interested in the basket right away. I chose one container and then moved the basket to the side. Then I showed Sarah how to open the container and the treasure inside. I did this with each container. After this I let her explore the basket. 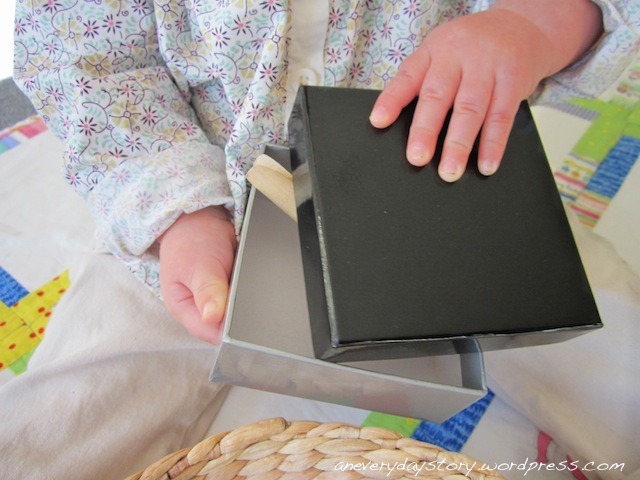 The ring box proved a little challenging at first but once she got those little fingers in it quickly became her favourite. The gift box was the easiest but she really liked taking the peg in and out so played with this one for a while. The glass jar was a little too difficult. I had to have the lid quite loose so she could twist it the rest of the way. However, when she finally did manage it, the surprise of the big pompom was definitely worth the effort. Look at the little face. So proud of herself. Jack loved the basket too and took great pleasure in showing Sarah how to open each container. Opening and Closing baskets are so appealing to little people. Simply increase the level of difficulty as their skills improve. In Jack’s baskets we’ve had lock and keys, push parasols, velcro, zippers, buttons, anything really and always a hit. It’s waiting on the playroom shelves now for Sarah to come back and play. I have been wanting to put one of these together for awhile. Thanks for the inspiration! Great idea. At the moment we have an small travel toiletry bottle (with a screw lid) a few pom pom’s and some ripped up paper in a basket – Iz loves it, she puts everything in and puts the lid on, before bringing it to me to help her take the lid off and then she empties it before starting all over again. I am so looking forward to doing those activities with my daughter ! She’s 6 months and a half and has just started crawling ! Are there any activities you would recommend? I would definitely recommend a treasure basket. Sarah had her first one around that time. She adores them. So many new things to discover. I have just put together a new one for her which I will post about soon. I try to make her a new one every month or so. Also when Sarah first started crawling she really enjoyed her clacker rattle and her bell cylinder. I would roll them towards her and she would crawl towards it and try to roll it back. So simple and yet so fun. Great idea to have a treasure inside. Thanks. Sarah really likes finding the little treasure inside. 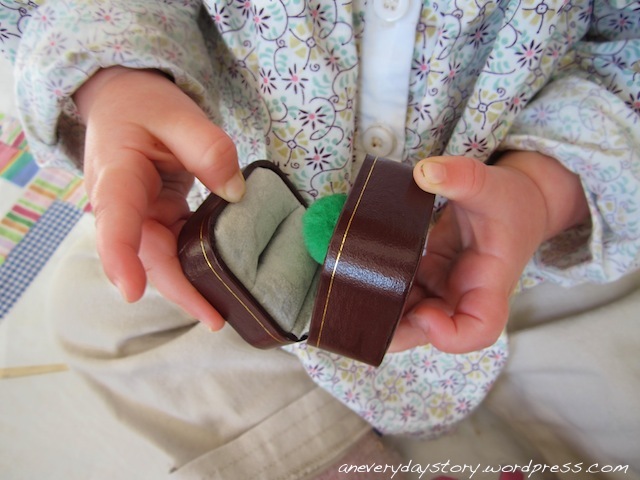 She opens each one, pulls out the treasure, has a bit of a look and then puts it back in again. She’s gotten pretty good at these containers now though, think it might be time for a new one. I have a baby girl, Alice, aged 13.5 months. So I think I can learn alot from your blog. We live in Poland. But I’m originally from Thailand. I’m very attracted to Montessori way as well, but haven’t really get into it. I set up a few sensory baskets for Alice before but that’s about it. Hi, thanks for coming by. Sarah is 15 months now and is mostly having one sleep a day. Maybe once a week she will have a second sleep during the day. This has meant that both her and Jack take a nap at the same time. This gives me some time to myself but also makes it a little difficult because I don’t really get one-on-one time with either of them. Sarah wakes in the morning after Jack. I help her to get dressed (her clothes are ready and where she can access them), then she has breakfast. I make breakfast for her although she is enjoying helping the food on her plate. After breakfast I help her to brush her teeth and comb her hair (she also has access to her toothbrush and comb). Then she has free play time with Jack while I do some cleaning. 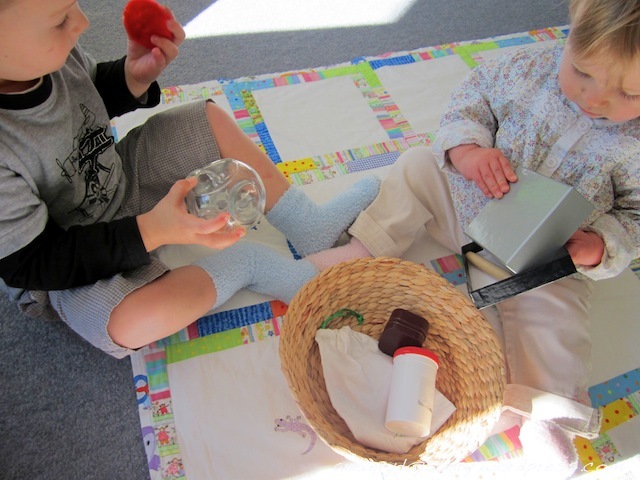 We all have morning tea together and then do an activity together. After the activity Jack and Sarah have free play time again, usually outside. At 12:00 we make lunch together. After lunch both Jack and Sarah have a nap. They each get a story and then off to sleep. They usually sleep for 2 hours. Sarah has a floor bed and so can get up when she is ready. Then it is time for afternoon tea. I try to keep the afternoons fairly unstructured. Usually we go for a walk or play in the bushland behind our house. I hope this is helpful. I might put a post together of a typical day.